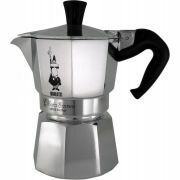 The italian moka pot is a stovetop espresso maker, which you can use to prepare authentic Italian style coffee at home. 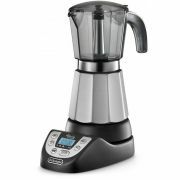 There are different types and sizes of stovetop espresso makers depending on the type of stove you have and the amount of coffee you want. For induction stoves, choose a stainless steel stovetop espresso maker. This type of moka pot will work on all kinds of stoves. The aluminium stovetop espresso maker will work on all stoves except for induction. The amount of coffee described as "cup" is a small espresso cup. 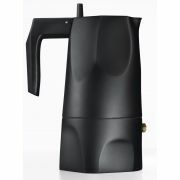 In other words with for example the 4 cup moka pot you will get approximately 2 dl of coffee. Use finely ground espresso coffee in your stovetop espresso maker. We will gladly assist you in choosing the right moka pot for you and don't forget to check out our broad selection of fine coffees for the perfect Italian coffee moment!